This is a study of autobiographical writings of Renaissance soldiers. It outlines the ways in which they reflect Renaissance cultural, political and historical consciousness, with a particular focus on conceptions of war, history, selfhood and identity. 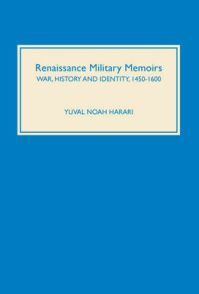 A vivid picture of Renaissance military life and military mentality emerges, which sheds light on the attitude of Renaissance soldiers both towards contemporary historical developments such as the rise of the modern state, and towards such issues as comradeship, women, honor, violence, and death. Comparison with similar medieval and twentieth-century material highlights the differences in the Renaissance soldier's understanding of war and of human experience.